Here we have what can only be described as the greatest bathtub toy of all time. 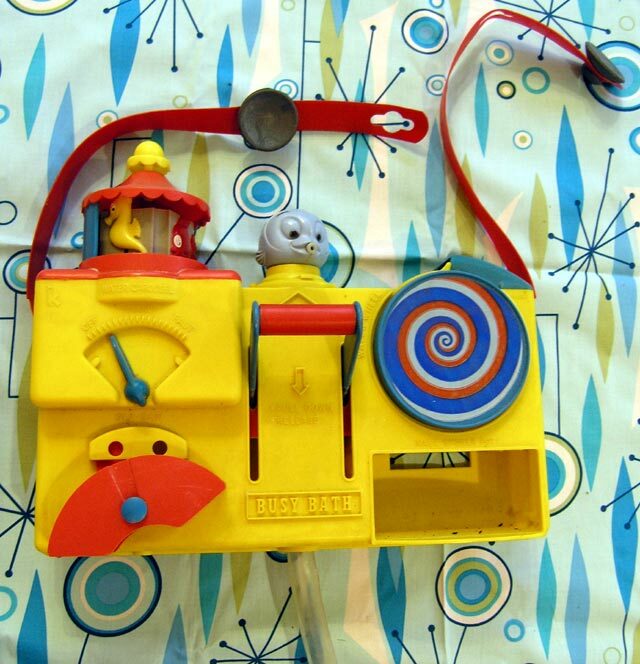 Other toys came and went, but this was a staple for many many years, and I remember it intimately. You install it with the red straps that go over the rim of the tub and connect to the outer part with the suction cups. The toy hangs into the tub, and the clear plastic on the bottom acts as a siphon. Pulling on the very cool lever (I loved that lever!) pumps water through it to the blue fish on top. To control the device, you turn the fish which spits out the water in the direction that it faces. Point it to the left, and you can make the merry-go-round spin. You can even control which way it spins by making more subtle adjustments to the spitting fish. The water drains from the merry-go-round into the red arc thingy, first into one side and then the other as one side fills and tips. You can actually control the speed with which it fills by adjusting the blue valve above it. If you turn the fish to the right, you can make the spiral turn. The water from the spiral pools into a sort of drawer, which you can pull out to drain. (I haven't yet located the drawer.) And of course, if someone is in the tub with you, you can point the fish at them to squirt water into their face. The fact that no part of the device has ever broken, despite years of heavy usage is a testament to the manufacturer (whoever they are).